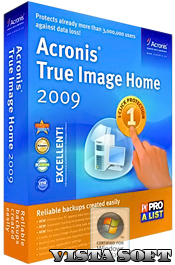 Acronis True Image Home 2009 complete PC protection: back up your entire PC, including the OS plus your data, applications, pictures, video, financial documents, settings and everything! Acronis True Image Home 2009 is an award-winning backup and recovery solution for a good reason: it protects your PC after just one click and allows you to recover from viruses, unstable software downloads, and failed hard drives. Create an exact copy of your PC and restore it from a major failure in minutes, or back up important files and recover them even faster. Search for file name and/or content within an archive, using Windows or Google™- desktop search. You can define rules for consolidating your archives to reduce storage space. Merge an older full backup with several incremental backups to quickly create a new full backup; subsequent backups are based on the newly-created full backup.